Classic Volkswagen and Porsche charity car show at Airkooled Kustoms in Hazel Green, Alabama on Sat. October 13, 2018. Registration and admission are free. Gates open 8 a.m. Family-friendly show. 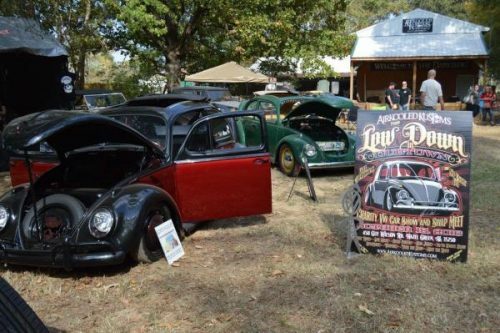 Airkooled Kustoms, an internationally recognized classic Volkswagen restoration and customization shop, announces its twelfth annual car show, Low Down in Dub Town. The event will be held on the shop grounds in Hazel Green, Alabama on Saturday, October 13, 2018 from 10:00 a.m. – 4 p.m.
Gates open at 8:00 a.m. for a day of family-friendly fun. The event is free to the public, featuring an engine blow, car contest, tech talks, and food vendors. Guests can tour the car restoration shop, meet the Airkooled Kustoms Krew to ask questions about classic Volkswagens and Porsches, shop for classic car t-shirts, and help support our nation’s veterans through the Train a Dog, Save a Warrior charity. Guests can purchase tickets for our annual engine blow 50/50 at registration. The Airkooled Kustoms krew has been hard at work bringing an unsalvageable engine back to life long enough for this highly-anticipated event. At 2:30 p.m., the engine will roar to life, and a timer will mark the seconds or minutes between ignition and complete and catastrophic engine failure. The 50/50 winner will be the ticket-buyer who guessed the time closest to the official engine failure time. The proceeds of the 50/50 will go to support Train a Dog, Save a Warrior. There is no entry fee for show cars, but pre-registration on the shop’s website is requested. Local classic Volkswagen enthusiasts are encouraged to enter their vehicles for a chance to be awarded a crowd favorite trophy, designed and built by Rodney Culp. Airkooled Kustoms is located at 458 Guy Wilson Road, (431/231 North to Pauline Drive, then straight onto Guy Wilson Road). For more information about the event, please visit Airkooled Kustoms online at: www.AirkooledKustoms.com or call (256) 828-2123.